It is a funny poem about body parts and a matching exercise after it. 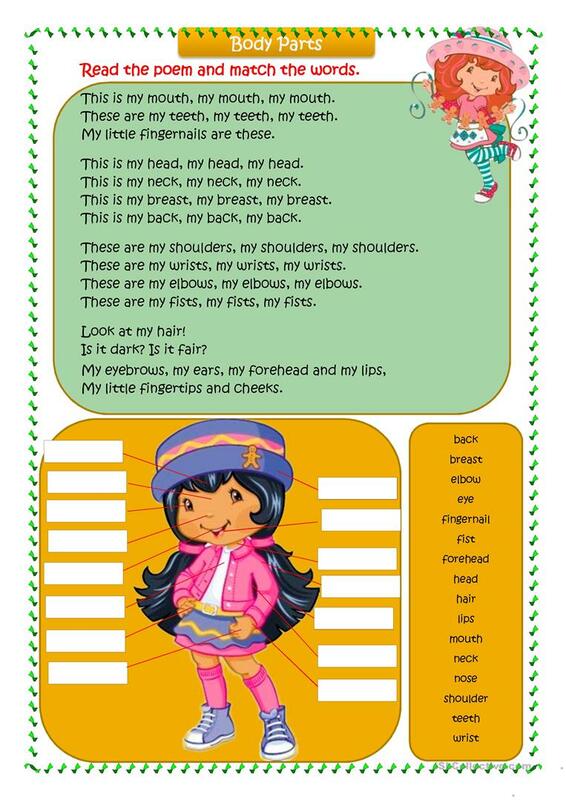 Children read or recite the poem and show the parts of their body. This worksheet can be used both for school and kindergarten children. The above downloadable worksheet is best suited for elementary school students and kindergartners and nursery school students at Beginner (pre-A1) and Elementary (A1) level. It is great for revising BE (auxiliary verb) in English, and is excellent for honing your groups' Speaking, Reading and Writing skills. It is focused on the vocabulary topic of Body. Lerlechka is from/lives in Russia and has been a member of iSLCollective since 2013-01-31 07:23:34. Lerlechka last logged in on 2019-04-22 07:16:40, and has shared 46 resources on iSLCollective so far.